"It's not a project. It's a calling." 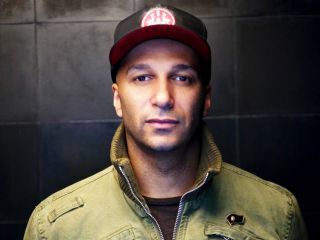 As guitarist for Rage Against the Machine (and the short-lived Audioslave) Tom Morello has created sounds with six strings that have turned heads, dazzled senses and shattered nerve endings. As The Nightwatchman, however, he does something quite different but no less extraordinary: he sets moods. Armed with a nylon-stringed acoustic and singing in a baritone so deep it makes Johnny Cash sound like a Bee Gee, he performs folk-based protest songs that both rattle and soothe the soul. The Fabled City (due Sept 30) is Morello's second album as The Nightwatchman (it follows last year's One Man Revolution) and it finds him expanding his sonic palette. Whereas the first record (produced by Brendan O'Brien, as is this one) was a mostly guitar-and-voice affair, The Fabled City is brimming with drums, percussion, organ, piano, mandolin, pedal steel guitar - the only thing you won't hear is a conventional electric guitar. "That's sort of the rule about being The Nightwatchman," Morello says, laughing. "If it doesn't fit the Woody Guthrie/early-Dylan/Springsteen Nebraska-era mold, then I'm barking up the wrong tree." The 11 songs on the Fabled City (which features appearances from Shooter Jennings and System Of A Down's Serj Tankian) tackle social injustice and personal loss in a way that is somewhat mysterious. The tunes are as raucous as they are elegiac. Like all great art, you feel the emotion first and get the meaning second. Craftsmanship disappears into naturalism on this, one of the year's best albums. It's a busy time for Tom Morello. Not only is he playing with the reunited Rage Against The Machine, but he's going to take a full band on the road for a Nightwatchman tour. On a rare day off, he sat down with MusicRadar to discuss the new record and to examine his approach to guitar playing, both as a solo artist and a member of Rage. Jovial, provocative and erudite, he's both loving and living his moment in the sun - and with talent this huge, it's going to last.